From January to March, China's exports rose 6.7 percent while imports soared 0.3 percent, Li Kuiwen, spokesperson for the General Administration of Customs, said at a press conference on Friday. That translated to a trade surplus of 529.67 billion yuan in the first quarter, up 75.2 percent year-on-year. "China's foreign trade situation was smooth in the first quarter despite uncertainties from the weaker momentum of global economy and trade growth. China's economy, which has been generally smooth while making progress, lays the foundation for the trade growth momentum," the official said. Another important reason is the Chinese yuan's stable exchange rate against the dollar since the beginning of the year, which also helped strengthen trade companies' confidence and expectations, according to Li. "China's foreign trade in the first quarter sends a positive signal to bolster market confidence. China will become the stabilizer of global trade," said Li, taking note of a slowdown in the global economy and trade. China's trade with the US slipped 11 percent to 815.86 billion yuan in the first quarter amid bilateral trade frictions. The figure accounted for 11.6 percent of China's total foreign trade during that period. China's exports to the US were down 3.7 percent to 622.43 billion yuan and imports from the US declined 28.3 percent to 193.43 billion yuan. "China's trade row with the US has had an impact on the operations of Chinese companies, but the impact is manageable. Relevant government departments are also taking measures to reduce companies' operational costs and foster confidence," Li noted. 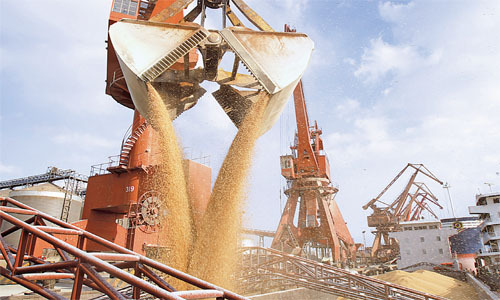 In the first quarter, China's soybean imports declined 14.4 percent to 16.75 million tons, customs data also showed. The price of soybean imports was up 8.8 percent.